The Danish plant runs a bit differently than other subsidiaries in Europe. Production of spare tires for about 1500 trailers, and changes between normal, M+S and winter tires for their large fleet of leased trailers on Danish roads, is all done centrally from Padborg. This gives a flow of at least 5-6.000 tires and wheels annually. 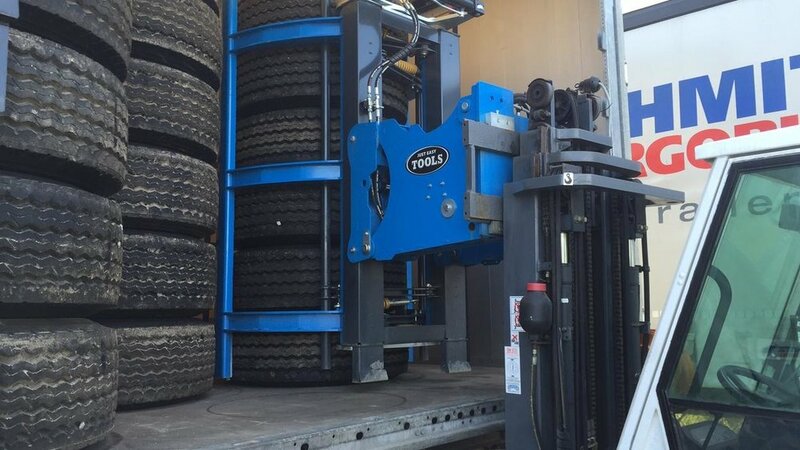 Just Easy Tools is specialized in optimizing tire handling processes for the tire industry – and has supplied the Easy Stacker successfully to both producers, distributors and retreaders in most corners of the world. Actually far more around the world than in Denmark. Having the Easy Stacker installed, it proved far more versatile than they imagined at Schmitz Cargobull. “I am going to think the Easy Stacker in to our future design of the plant” Flemming Brandt states and continues: “Besides from the unloading and loading, it benefits us in so many ways”. Today it takes one man only 45 to 60 minutes unloading a truck – a significant improvement. Also, stacks are more even now and time is also saved moving tires in the production, according to Flemming Brandt.